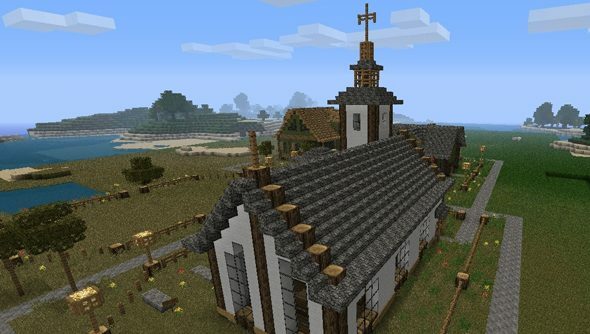 The latest Minecraft update-in-testing is a mixed blessing for budding church builders. They’ll no longer be mortified to discover that their Stained Glass recipe yields just six panes rather than the expected 16. But equally, if they’re not careful they’ll lead a procession of flame down the aisle via the plush red carpet they’ve had installed. Elsewhere in the update, Mojang have seen off a problem with pausing the game, while the unexpected sort of pausing – more commonly known as crashing – is less likely to occur when watching falling blocks or selecting an alternate texture pack. Other bugs dealt with had seen the maximum render distance set to a positively claustrophobic eight chunks and caused iron bars to render oddly. Oh: and white stained glass plane no longer has a typo in its title. Another gift to steeple architects. See Mojang’s own page for changelog highlights. You can access snapshots in the usual way: by opening your Minecraft launcher, hitting the ‘New Profile’ button, creating “snapshots”, and then ticking the ominous box labelled ‘Enable experimental development snapshots’. You can switch back to vanilla Minecraft at any time via the dropdown menu in the bottom left corner of the launcher. This snapshot was delayed last week, by the way, leading Duncan to fill his usual Minecrafting slot with the lowdown on how to prank your friends. Have you tried out any of his recommended tricks?